Useful for identifying small features, understanding the distribution surface chemistry or examining the thickness variation of ultra-thin coatings. 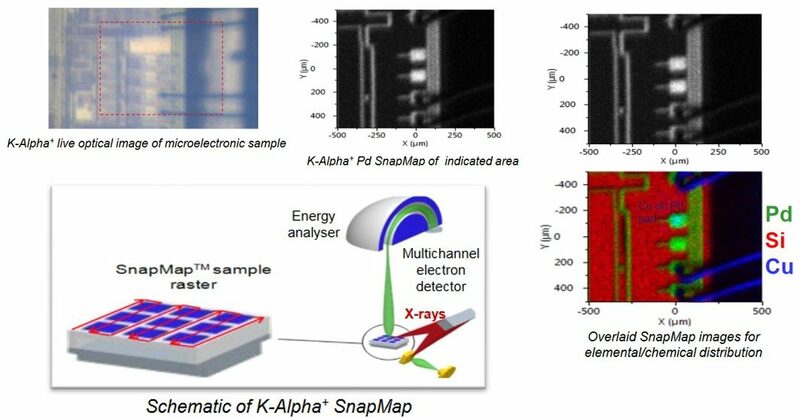 Parallel acquisition simultaneously images the entire field of view without scanning voltages applied to any spectrometer component. Parallel imaging provides a set of quantitative images that can be acquired within minutes. This method is faster than the mapping method, typically achieving an image resolution of <3 μm. Subsequent data processing produces a relative atomic concentration image that can be used to define the elemental and chemical composition as a function of position. Serial acquisition of images is based on a two-dimensional, rectangular array of small-area XPS analyses. This method enables measurements of the distribution of elements or chemical states. Serial acquisition is generally slower than parallel acquisition but can collect a range of energies at each pixel compared with collecting only a single energy for parallel acquisition. Using this method, the analysis position is fixed and the specimen surface is moved with respect to this position. All systems at Harwell, Cardiff and UCL are capable of performing XPS imaging.